One year ago, having just landed on these shores, I opened the second annual FASS Festival of Research, and congratulated you all on the kaleidoscope of excellence in research and innovation that I had already found. During my first year at Surrey, the chaos around us has continued to escalate, with Brexit, the Augar Review of Post-18 Education and Funding, and enrolment downturns (4% for us v 1% for the sector overall – moving daily) highest on our lists, but the Industrial Strategy not far behind. Three of these four are clearly disruptive with potentially not much to look forward to, but the latter represents the largest expansion of university funding in 40 years. Its Grand Challenges are broad – Artificial intelligence and data; Ageing society; Clean growth; and Future of mobility – with much synergy and lots of opportunity for the faculty. And the Industrial Strategy is set against a backdrop of the Government’s target of 2.4% of GDP spent on R&D by 2027, a massive rise from the 1.7% right now. The government rightly sees this as industry led, but with universities playing a central role in that ambition. In short, risks and opportunities abound. Lord Willetts, the former higher education minister, wrote in A University Education: “It is clear that university expansion changes lives for the better.” And there is an appetite from outside for engagement with Surrey to drive that expansion. Our Strategic Hires campaign has landed a research star in each of the other two faculties – each expected to considerably expand our research base – where is our strategic hire for FASS? Contact Graham Miller with your ideas, and that extends to our VC’s Fellowship scheme – 3-year 0.2 FTE posts to deepen engagement of the world’s best and brightest with Surrey. They have started to arrive. And more: we have received 300 applicants for the inaugural, early-career 3-year Surrey Research Fellowships – a dramatic example of the level of desire to engage in research at Surrey. Finally, our ambitious plan to double the number of PGRs by 2022/2023 has kicked off in earnest: against a national backdrop of a 9% average decline in PGR numbers, our applications are up 40%. Now, to convert them to enrolments of higher quality than ever before. Surrey does, indeed, need to continue that expansion in its research and innovation – in line with the goals in our Corporate Strategy. Encouragingly, we are trending upwards in our international rankings, and a place in the top 200 is achievable, but not quite yet within sight [ARWU (372); QS (248); and THE (256)]. We need simultaneously more mass and more focus to achieve the visibility and scale necessary for wider impact and enhanced reputation. Where are we achieving in FASS right now? In the ARWU: Hospitality and Tourism ranked 5th, our highest ranking of the five subjects featuring in the top 100. In the QS: Hospitality and Leisure Management ranked 4th; and in the THE: Business & Economics, Social Sciences, and Law all rank between 100 and 200. Congratulations to all those whose collective efforts have produced these results. The strategies I have outlined seek to grow the girth of our redwoods, and the extent of our forest – let us then not forget the wider opportunity of our ecosystem – engagement through collaboration and partnership. There remains the opportunity to capitalise on the critical mass of research we have on the societal impacts of technology as a Surrey Research Theme, led from FASS. Graham and I are just waiting to identify a leader. Which brings me to my last point – FASS and the “I” word, Innovation. Whether it be via the driver of the Industrial Strategy, the imminent Knowledge Exchange Framework, or the impact case studies of the Research Excellence Framework, we are consistently being given the entirely reasonable message that our research should matter – it should effect change in society – have an impact. Reassessment of the meaning of the doctorate is taking place in the Technē AHRC Doctoral Training Partnership, in which Surrey participates. Not all our graduates, indeed, only relatively few of them, will end up in academia – are we training them for the right future? A very worthwhile conversation. This year we received our first Impact Accelerator Account award from the ESRC – matching those from the EPSRC and STFC. 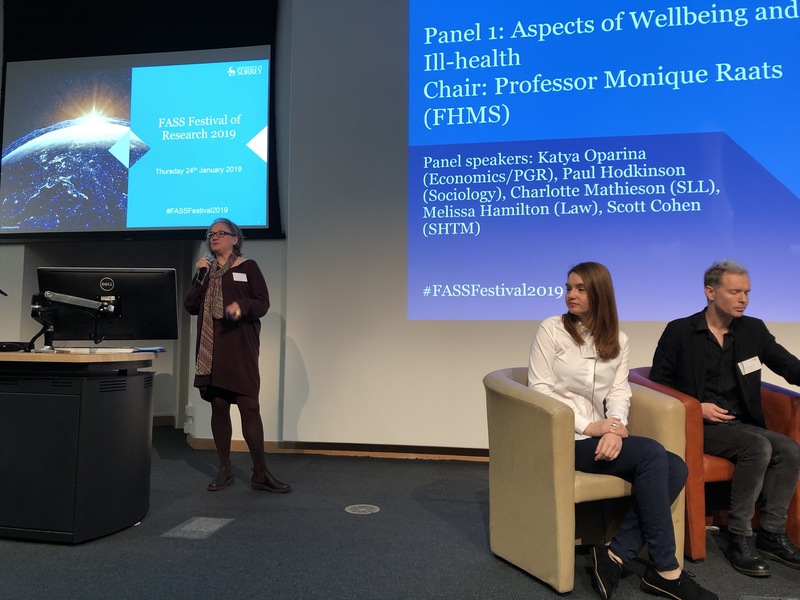 FASS academic’s research directly supporting society – brilliant! And the Centre for the Evaluation of Complexity Across the Nexus (CECAN) was not only renewed by the ESRC, but has started a new company to further the results of its innovative social policy modelling research. Designing a new, integrated way of engaging with partners. Today is a fine demonstration of what it means to be at Surrey – our values on display – ambition, collaboration, excellence, integrity, and respect, whilst we engage in what we love – talking about our research – the next best thing to actually doing it. May your afternoon be rich and productive.